A 57-year-old man presents to the emergency department (ED) complaining of vague left shoulder pain for the past 3 months following an incident in which a garage door fell on him. The pain is slightly worse with movement, but he denies any limitation in the range of motion. The pain is dull and has recently become increasingly severe. He denies experiencing any prior trauma to the area, as well as any history of arthralgia, myalgia, other associated symptoms, or any prior surgeries or medical problems. He denies any weight loss, chills, night sweats, or recent illnesses. He previously smoked about 1 pack of cigarettes per day for about 30 years, but he quit 8 years ago. He admits to drinking 1 or 2 beers every night. He does not use any illicit drugs and does not take any medications other than an occasional nonsteroidal anti-inflammatory drug (NSAID), which seems to relieve the pain. He has no allergies. On physical examination, the patient's oral temperature is 99.5°F (37.5°C), his pulse has a regular rhythm measured at 87 bpm, and his blood pressure is 136/88 mm Hg. He is noted to be in mild distress as a result of his left shoulder pain. The examination of his head, including inspection of the ears, eyes, and throat, is normal. His lungs are clear to auscultation. His heart sounds are normal and no murmurs are detected. His abdomen is soft, nontender, and no distention is noted. He has full range of motion of the left shoulder and neck. Mild tenderness to palpation over the posterolateral aspect of the left scapula is found, but no lumps or nodules are palpated. He does not have any skin lesions. He is neurovascularly intact throughout both of his upper extremities, with symmetric reflexes. No pain is elicited with provocative maneuvers of the shoulder, including with Neer, Hawkins-Kennedy, or O'Brien tests. Laboratory studies, including a complete blood cell count (CBC) and a serum electrolyte panel that includes calcium levels, are obtained in the ED and are found to be normal. Plain radiographic films of the left shoulder are obtained, which reveal multiple well-circumscribed lytic lesions of the neck and glenoid regions of the scapula (Figures 1-3). The patient is discharged from the ED with pain medication and a shoulder sling for comfort. He is asked to follow-up with the orthopedic clinic within the following week. Serum immunoglobulin levels and serum and urine protein electrophoresis are all normal when obtained in the outpatient clinic. A biopsy is performed, which reveals a clear margin and a narrow zone of transition to normal surrounding bone. Hint: Note the lytic characteristics of the lesions. Isolated bone plasmacytoma (IBP) refers to a malignant, monoclonal plasma cell tumor growing only in bone. IBP is usually discovered as an incidental finding during routine radiographic studies for a separate, unrelated condition; however, patients may present with a single painful bone lesion. IBP most commonly involves the axial skeleton (primarily, the vertebrae), although any area may be involved. Patients mainly complain of painless swelling of the ribs, sternum, or other parts of the axial skeleton. IBP has a male-to-female ratio of 2:1, with a mean age of 55 years. Burt et al showed that the ribs, clavicle, sternum, or scapula were involved in 20% of patients presenting with IBP. Although diagnostic criteria for identifying IBP vary among authors, it is generally agreed that the presence of at least a single destructive bone lesion on plain films along with a fine-needle aspiration or core biopsy revealing infiltration by plasma cells are needed to establish the diagnosis of IBP. A skeletal survey with or without a bone scan is also helpful for ruling out other lesions, which could convert the diagnosis to that of multiple myeloma. In addition, laboratory studies, including a CBC, serum immunoglobulin levels, serum and urine protein electrophoresis, and a serum electrolyte panel including calcium levels, should be performed. A full skeletal survey should also be performed. Magnetic resonance imaging (MRI) studies of the thoracic and lumbar spine with bone marrow aspirate should be part of the routine clinical workup in all patients presumed to have IBP. The absence of any further destructive lesions on the skeletal survey (specifically of the axial skeleton) and an absence of clonal plasma cells in a random sample of bone marrow help to differentiate IBP from multiple myeloma. Lack of hypercalcemia, anemia, urinary monoclonal protein, and renal impairment also aids in the diagnosis of IBP. MRI is a noninvasive and useful means for investigating a large volume of bone marrow which, in some cases, has revealed multiple myeloma in patients with a presumed diagnosis of IBP. Even as early as 1993, Moulopoulos et al showed that 33% of patients with an apparent isolated lesion were subsequently found to have evidence of multiple myeloma after MRI examination. Therefore, a negative MRI scan of the thoracic and lumbar spine is necessary to rule out multiple myeloma prior to making a definitive diagnosis of IBP. 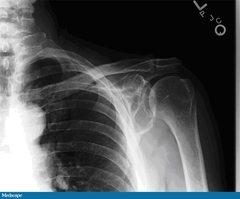 Radiography will typically show a lytic appearance. Patients with vertebral lesions may present with neurologic compromise as well. Schindler et al reported that IBP may present with signs and symptoms of demyelinating polyneuropathy. Imaging of the spine by MRI is required in the setting of vertebral involvement with neurologic deficit. Bone scanning is usually unreliable. MRI characteristically shows a focal area of bone marrow replacement on both T1- and T2-weighted images. Biopsy reveals a clear margin and a narrow zone of transition to normal surrounding bone. Recurrent IBP without any evidence of multiple myeloma may develop after appropriate radiation therapy. In these cases, careful evaluation of the bone marrow, a bone survey, and an MRI scan of the axial skeleton must again be performed to definitively rule out multiple myeloma. After completion of radiotherapy, patients should be monitored for local recurrence and/or new bone lesions, as well as for any progression to multiple myeloma. Serial serum and urine electrophoresis, CBC, and renal functioning should be evaluated every 4-6 months. A skeletal survey should be performed every 6-12 months in order to monitor any new bone lesions. The majority of patients with IBP will develop multiple myeloma within 2-3 years, and some authors believe IBP to be an early manifestation of multiple myeloma. [12,13] Patients with the best prognosis are those in whom the monoclonal protein is undetectable 1 year after radiotherapy. Elderly patients with IBP or patients who have immunologic compromise have an associated risk of progression to multiple myeloma. New bone lesions, development of marrow plasmacytosis, and an increasing myeloma protein level indicate progression to multiple myeloma. There has been no direct correlation between the dose of local radiation therapy and the possibility of disease progression. Holland et al were able to correlate the size of the lesion (≥ 5 cm) with increased conversion rates to multiple myeloma. Mayr et al showed that adjuvant chemotherapy may prevent IBP from progressing to multiple myeloma. Others have found that adjuvant chemotherapy delays progression to multiple myeloma by 30 months; however, current trends in the literature do not encourage the use of adjuvant chemotherapy for patients with IBP. In addition, early exposure to chemotherapy may also increase resistance to other future chemotherapeutic options if multiple myeloma arises. Wilder et al have shown that the persistence of myeloma protein for more than 1 year after radiotherapy was the only independent prognostic factor indicating that patients with IBP will eventually develop multiple myeloma. With more radiologic and technologic advancements, the diagnosis of IBP should become less common, and earlier detection methods with more sensitive staging procedures may decrease the overall incidence of IBP in the future. In the patient in this case, treatment with 4500 cGy in 25 fractions was performed after core biopsy revealed infiltration by plasma cells. The patient had an initial local MRI scan of the lesion, and extensive imaging ruled out remote disease. The biopsy findings were consistent with IBP. He did not have any detectable monoclonal protein levels at his most recent follow-up visit with the oncology service at 6 months following radiation therapy, and he continues to be in good condition, without any symptoms of shoulder pain. A skeletal survey is currently planned for his next follow-up appointment.